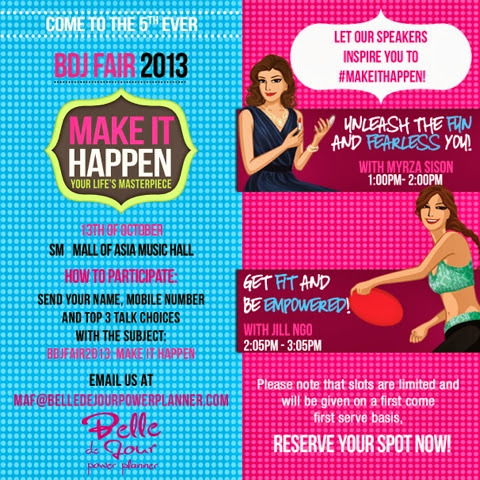 I'm pretty much excited to attend and experience the much awaited BDJ Fair 2013 with the theme #Makeithappen. And the ONE thing that I want to #makeithappen this 2014 is to finally have my online cake and cupcake business finally blossom into a physical store. 2013 has been good year to my business and I feel that 2014 is the year to take it a notch higher! This inspiring thought is what makes the Belle De Jour planner a must have in every ladies life and I'm pretty sure it will help me get to my 2014 goal. I can't wait to get my hands on this plannner and you too can get the planner at the fair at a discounted price, only at the BDJ fair. Another perk to be excited about are the talks featured in the fair, from fashion to fitness, you'll sure learn some pretty cool ideas. 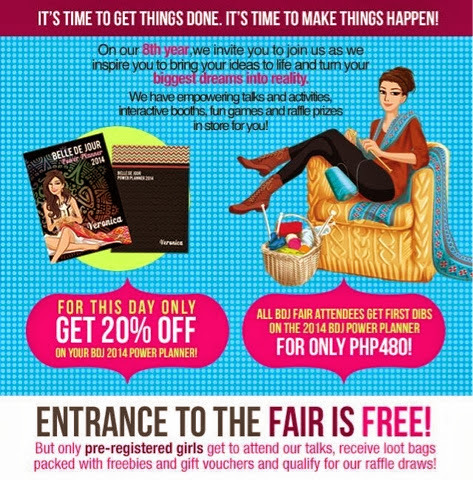 Here's what you need to know: YOU are invited to the BDJ Fair 2013: #Makeithappen on October 13 (Sunday) at the SM Mall of Asia Music Hall. Entrance is FREE and walk-ins are definitely welcomed! However, pre-registered girls will get some special perks! Just visit fb.com/belledejourplanner and ilovebdj.com for more details. Don't forget to register and See you there!